The term “arms race” is overused. But China and India are spending more even as their GDP growth falls. Speculation that Asia is in the throes of an arms race has been about for longer than most defense watchers would care to remember. The speculation is usually idle, with the “arms race” label slapped casually onto news items that are really only about normal defense procurement. Almost all countries invest continually in their armed forces, and improve their capabilities according to their own particular means and requirements. That’s not an arms race. However, the latest Trends in International Arms Transfers report, released this week by the Stockholm International Peace Research Institute (SIPRI), may point to the fact that something more than run-of-the-mill defense procurement may be happening in Asia. The SIPRI data tracks only weapon imports and exports, not domestic defense procurement, which accounts for most of China’s military outlay, for example. But the finding that Southeast Asian arms imports increased 185 percent in the period 2007 to 2011 compared with 2002 to 2006 is an eye-opener, however you look at it. Even then, if we follow the dictionary definition of an arms race as being “competition between countries to achieve superiority in quantity and quality of military arms,” you have to doubt whether this describes what is occurring in Asia. Take the Philippines and Vietnam, which are both investing in their militaries to help protect their interests from China: there isn’t the slightest expectation that they will achieve superiority over the Chinese military in any department. Indonesia is beginning to ramp up funding for its armed forces, but Jakarta’s modest assembly of a “Minimum Essential Force” suggests it is racing only against the galloping obsolescence of its own rusting kit. Singapore continues to plough money into defense, but it won the quality race against Indonesia and Malaysia many years ago, having never so much as entered the quantity contest. So, if there’s an arms race in Southeast Asian, it’s one concerned with avoiding the geostrategic wooden spoon. In spite of that 185 percent increase, these countries remain several laps behind the world’s, and even Asia’s, frontrunners. In much the same way, the U.S. is so far ahead of the chasing pack that it can’t be considered part of any meaningful race – especially with U.S. spending on defense slowing down, which is hardly the way you’d expect a racer to behave. It’s to China and India that anyone concerned about an Asian arms race ought to be paying attention. Both Beijing and New Delhi would of course publicly reject the idea that they are engaged in an arms race, and argue that they are simply modernizing their armed forces. At what point, though, do the scales tip away from normal modernization and towards arms-racing? There’s a sense that the scales have indeed begun to tip. The evidence is in the slowing of the Chinese and Indian economies. Double-digit defense spending rises are proportionate when the wider economy is growing at a similar rate. 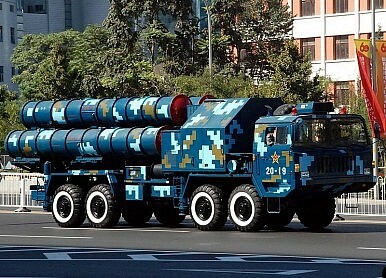 However, China’s defense budget is rising by 11.2 percent this year, against anticipated GDP growth of 7.5 percent. India’s defense budget is rising by between 13 and 19 percent, depending on your interpretation of the numbers, against forecast GDP growth of 7.6 per cent. Defense spending growth appears organic when it tracks GDP growth, because it sends a statement that defense has a fixed place in a country’s economic framework. But when it starts to outpace GDP growth, it looks like the country in question, and its military, are trying to get somewhere in a hurry – and that defense is ascending the ladder of government priorities. The Chinese and Indian economies may now be experiencing structural changes that will consign the days of double-digit GDP growth to history. If, despite this structural slowdown, Beijing and New Delhi continue to fund double-digit defense spending rises, then we will know that the race is on.